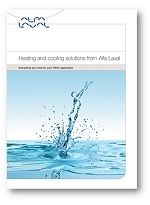 Alfa Laval AlfaQ™ heat exchangers are used for HVAC applications such as district cooling substations, ice-storage systems, data centers, and free cooling systems. The range is certified according to the AHRI Liquid to Liquid Heat Exchangers (LLHE) Certification Program which ensures thermal performance according to manufacturers’ published specifications. AHRI certification is the only global, third-party performance certification for plate heat exchangers. The Air Conditioning, Heating and Refrigeration Institute (AHRI) certification is an independent, third-party verification of thermal performance. Through its certification program and standards, AHRI strives to help customers save energy, improve their productivity and help to ensure a better environment. AHRI Liquid to Liquid Heat Exchanger (LLHE) Certificaiton Program ensures that the product performs in accordance with manufacturers' published specifications, and is particularly useful in applications such as district cooling substations, ice-storage systems, data centers and free cooling systems. For more information, visit Alfa Laval's HVAC AHRI perfomance certification page . 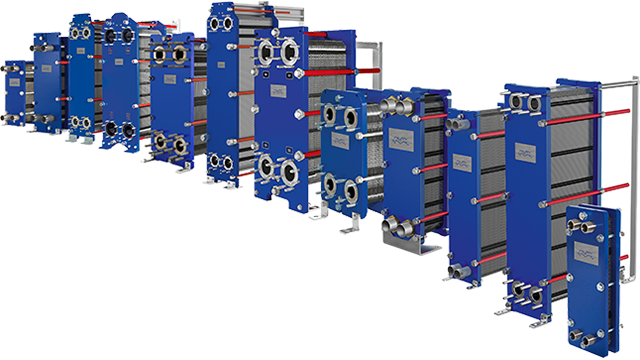 Alfa Laval AlfaQ™ gasketed plate-and-frame heat exchangers are available to meet most heat transfer requirements – whether large or small – demonstrating our commitment to optimizing the performance of our customers’ processes. Glued gasket – a two-component, oven-cured epoxy glue that keeps the gasket in place during any possible cleaning condition. Additionally, the pressure plate roller, the bearing boxes on tightening bolts, and the 5 point alignment system with reinforced hangers make opening and closing the heat exchanger quick and easy without the need for heavy tools or the risk of damaging the plates. AlfaQ™ is quick and easy to modify if process parameters change. Our team’s expertise and the availability of parts bring you peace of mind. Single plate with a chevron pattern design for parallel flow allowing for optimum thermal performance and pressure drop. Single plate with a chevron pattern design for diagonal flow through the heat exchanger when it is mounted horizontally and requires draining. The Air-Conditioning, Heating, and Refrigeration Institute (AHRI) Product Performance Certification Programme is a voluntary programme, administered and governed by AHRI, which ensures that various types of heating, ventilation, air conditioning, refrigeration, and water heating products perform according to manufacturers’ published claims. Products that are certified through the AHRI Product Performance Certification Programme are continuously tested, at the direction of AHRI, by an independent third-party laboratory, contracted by AHRI, to determine the product’s ability to conform to one or more product rating standards or specifications. AlfaQ™ is available with various pressing depths and angles of the chevron pattern and various shapes of the corrugation which are carefully designed and selected to achieve optimum performance. The CurveFlow™ and the chocolate pattern distribution area are two design features available that ensure fluids are evenly distributed across the entire plate. The result is that the entire heat transfer surface is fully utilized and stagnant zones that can result in fouling are avoided.